Telephone 07780468805 or 01361 883727 after 6 p.m. The Scottish Borders is home to some of the most beautiful scenery in the UK - connected by some of the best driving roads in the UK. Can you see why we are Mazda MX5 enthusiasts yet?! Scotland's capital is just up the road from us and easily accessible by Edinburgh Airport and Edinburgh Waverley train station. Edinburgh offers a wonderful mix of history, shopping, culture, cuisine and nightlife. Starting with Princes Street you'll find a 1 mile stretch of shops all in the shadow of Edinburgh's famous castle. Parallel you'll find a wide range of bars on Rose Street, designer shops on George Street and further into the New Town you'll uncover gems like Stockbridge, Canonmills and Broughton Street. Moving South across one of the city's many bridges, you'll find yourself in Edinburgh's Old Town which is awash with history buildings over 800 years old. Further out of the city you'll find friendly towns such as Musselburgh, South Queensferry and North Berwick. Just up the road from us and home of Duns castle, the "Ba games of Duns", family run pubs and several homely B and Bs. However, it is perhaps best known for being the birth place of Jim Clark, widely renowned as the best Formula 1 driver of all time. As well as an annual rally named after him, there is also a museum in the town: "The Jim Clark Room". We definitely recommend a visit for any petrolheads. If you're a mountain biker, you're in for a treat with two of the best known biking spots in the UK. A recently redeveloped centre offers a lovely Café, bike shop (including rental bikes), showers, bike wash and even wigwams! Of course, in this case you'd be better off with a more practical car than a Mazda MX5, it's not unusual to see one in the car park! If you're travelling South from the Borders, we recommend a stop in Alnwick. In recent years it has been propelled into the limelight having been featured in the likes of Robin Hood, Blackadder and even Harry Potter. The famous castle and gardens are surrounded by family run cafés, tea rooms, pubs and restaurants. Several other towns nearby offer fantastic days out such as Bamburgh, Seahouses, Newton-by-the-Sea and Morpeth. Don't forget to try the famous Craster Kippers if you're in the area! Perhaps the best known driving roads in the UK, the Highlands are regularly featured on the likes of Top Gear and Fifth Gear. 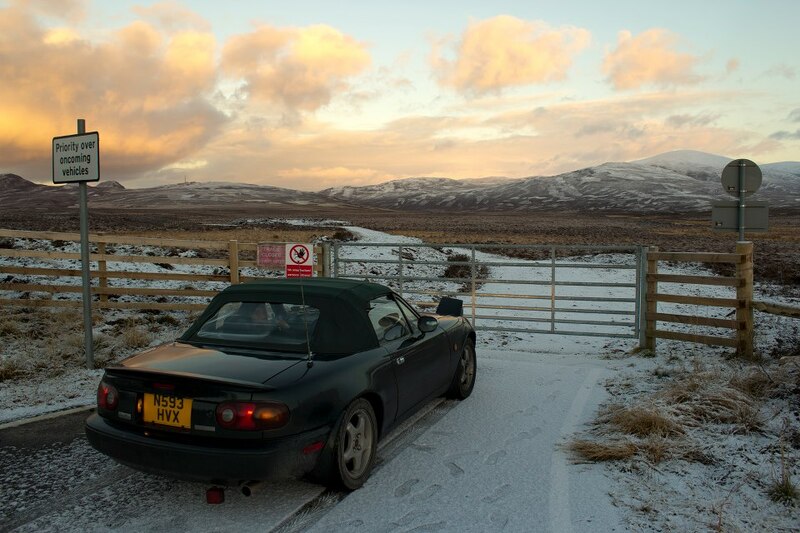 We can't recommend a long weekend in a Mazda MX5 enough, in fact, you can see one of our adventures below! At the time we were in a Eunos Roadster VR Limited Combination B - a wonderful car to tour the country in. Call us any day of the week on 07780468805 or 01361 883727 if after 6pm, or complete our contact form.